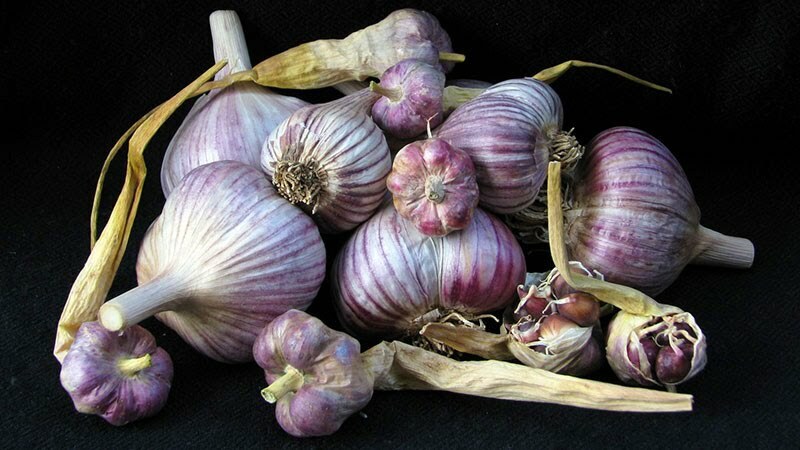 The Asiatic Group of garlics are the second group to have evolved in Asia along with the Turban Group. Compared to the Turbans, Asiatic’s have a preference for warmer climatic conditions, fewer number of cloves, size and number of bulbils and have a hotter, spicier flavour … phew … quite a kick. Bulb Skin: Can produce white (Japanese) or purple vibrant skins with consistent purple stripe, however in warmer climates skins can become white. Cloves Number: 4-8 large wedge shaped cloves in a single round with similar vivid cloves skin colours of Turbans, often with buff brown on base and strong pinks on clove tips. Bulbils: 4-10 Purple bulbils in the scape. Growing: Develops 4-6 leaves before winter dormancy. Has medium to wide mid-green leaves that fold on upper third and develops between 8-10 leaves. Harvest: Before Turbans. In cooler, wetter climates where skin loss in the ground is a risk – harvest with 4.5 green leaves to ensure good bulb coverage. If growing in hotter, dryer climates may be able to harvest when almost all leaves have dried out. AT THIS TIME I HAVE ONLY ONE ASIATIC IN BREEDING WHICH WE ARE TARGETING A 2020 RELEASE.